Infrastructure-as-a-service (IaaS) is a foundation level cloud service to provision processing, storage, networks, and other fundamental computing resources to customers. The highly scalable, highly automated resources provided can be adjusted on-demand and utilises a pay-as-you-go model that removes the expense of deploying in-house hardware and software. Your in-house IT team does not manage the underlying cloud infrastructure but still has control over operating systems, storage and deployed applications. Simply: IaaS is a scalable and flexible infrastructure to meet organisation needs. Why choose Trustmarque‘s cloud infrastructure service? With our Infrastructure-as-a-service Public Cloud Service, you can use the Cloud as and when you need to, so you only pay for what you use, rather than undertaking the huge financial and resource cost of purchasing and installing your own hardware. Trustmarque’s IaaS solutions enable organisations to cost-effectively deploy and run their software, whilst taking full advantage of the benefits of cloud computing. We provide specialist technical design, management knowledge and understanding of the commercial implications of solution design and change, along with the operational considerations of a Cloud service within a traditional ITIL oriented environment. We provide highly resilient and secure IL2, IL3 and IL4 services for OFFICIAL and OFFICIAL SENSITIVE hosting requirements. These convenient, on-demand and configurable computing resources require minimal management effort. And you can rest assured you are using best of breed technology, securely managed by our team of specialists 24×7. We are a No.1 Cloud partner with Microsoft and have experience in delivering cloud services to both public and private sector organisations across a range of industries. Our ISO27001, PSN accredited IAAS service is used by Police forces, The Home Office, Ministry of Justice and Local Authorities. 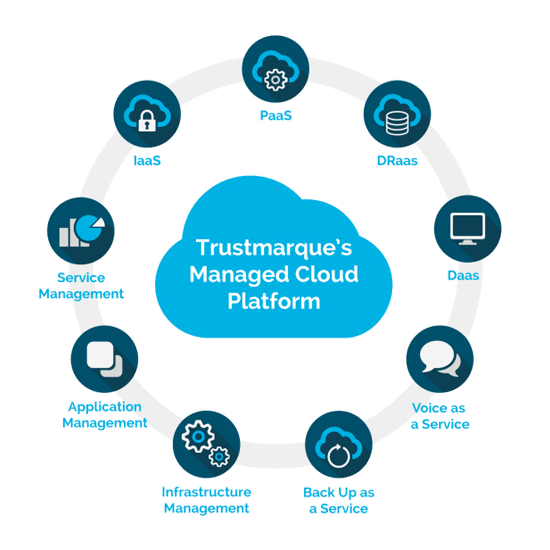 Trustmarque’s managed cloud platform allows organisations to run business-critical applications in either a managed private or public cloud environment. We look to continually develop the platform’s architecture so that it adheres to the latest industry best practices and security standards, offering comprehensive SLAs right down to the virtual machine level. Transforming the business with cloud technology is top of the CIO’s agenda, but the ongoing management, maintenance and optimisation is a significant distraction for most IT departments. Trustmarque’s Virtual Machine management service provides management and support to optimise all your cloud infrastructure and applications. Our cloud experts will work with you to plan the best approach for moving your infrastructure to the Cloud and ensures your organisation achieves maximum gains from Azure, focusing on adding value to your organisation.